As a mathematical model for determining the probable number of outcomes, the new Poisson Distribution tables have long been an easier tool to use for reliability analyses. 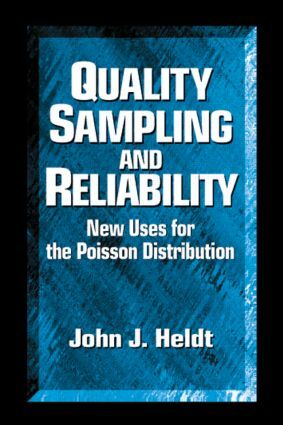 Longtime quality professional, inventor, and consultant John J. Heldt now makes the Poisson Table even more useful-creating two new tables (available only in this book) with the Poisson terms rearranged for further ease of estimation. Quality Sampling and Reliability: New Uses for the Poisson Distribution simplifies the steps involved with reliability testing; Mean Time Between Failure (MTBF) assessment; advantages and risks involved in reliability life testing; and an example of methodology for tracking the MTBF for products in the field. Written for easy comprehension, with numerous illustrations, Quality Sampling and Reliability: New Uses for the Poisson Distribution will help quality professionals, engineers, instructors and students alike in their reliability testing tasks. "…illustrations of this book enlightening and capable of providing quick solutions to immediate practical engineering problems as well as an improved understanding of statistical quality control. …makes reliability work much easier and can be used for quicker release of statistical information."